Calendula, also known as pot marigold, is by far one of my most favorite plants in the herb garden. I started growing Calendula last year in order to have a fresh and purely organic supply of petals and flowers for making lotions and medicinal salves; as the soothing and healing power of this beautiful bright yellow/orange flower has been experienced in my home. These days — because of all the attention and well-documented research on the flower — you can easily find Calendula, in some form, as an ingredient in a variety of products. Yet, did you know that making your own Calendula lotions, balms, and salves can be done for a few dollars when you grow your own! Let’s learn how to go about growing Calendula this spring so that you can enjoy the benefits of this amazing plant! After a long winter, Calendula’s vibrant colors are a welcome site in my garden. I highly recommend that everyone grow it! It’s especially perfect for the beginner because it’s so easy to grow from seed, it can be grown in most soil types with little effort, and it freely reseeds itself. Calendula, without a doubt, makes an awesome addition to any landscape. Historically, I’ve never been really big on growing flowers, but Calendula…it’s here to stay. You can grow Calendula directly from seeds that are sown early in the spring season, and covered ever so slightly with garden soil. They start growing immediately and will grow very quickly. Calendula grows best when sown directly into the garden. It tolerates any type of soil and will grow in partial shade to full sun. It will do well in almost any soil, and semi-shade as well. 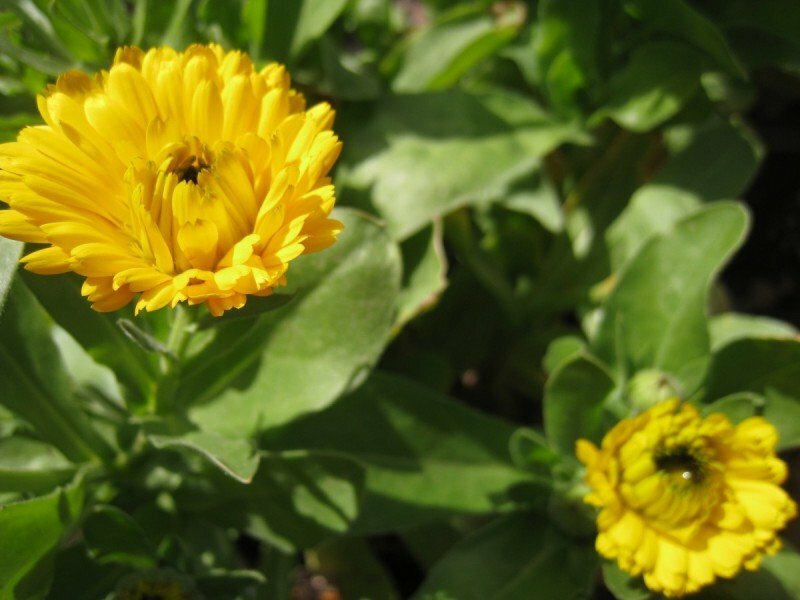 Calendula takes well to pot culture, and is easily grown in a variety of pots and window boxes on a balcony or deck. From seed, you can sow it directly into the garden any time after the last frost in your area (click here to find your local freeze/frost information). Generally you’re looking at an initial planting during the early spring and succession planting throughout the summer season. This will ensure a continuous supply of flowers. Note: You can start it indoors a few weeks before the last frost date if you’re anxious to get a headstart. Calendula likes water, so be sure that the soil doesn’t dry out. Fertilizer isn’t necessary, but your flowers will thank you if you were to add plenty of yummy compost. In order to harvest Calendula flowers and petals for medicine making, it’s best to pick them at their peak — and pick them frequently. You really can’t over pick these flowers! Harvesting the beautiful flower-heads force the plant to send out more buds. 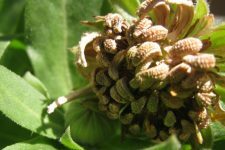 In fact, under harvesting will cause the flower-heads to go to seed and stop producing quickly. Whether you use the fresh flowers to make Calendula-infused oil (more to come on that topic) or dry them until crisp to use later (read more here) — you’re guaranteed to have an exceptionally wonderful raw material ready to make a variety of healing remedies. Where to Purchase Medicinal-Quality Calendula Seed? –Mountain Rose Herbs…they sell Horizon Herb Strictly Medicinal seeds! The best in the business in my opinion. -This year should be the only year you invest in seed, because from here on out you can harvest the flower-heads and save the seed in order to fill in the gaps. Otherwise, it does a pretty good job of reseeding itself. Are you planning to grow Calendula this year? I’ve been wanting to grow calendula because I also infuse it and use it in my lotions and soaps. I bought a supply of dried online, but would love to have my own. Thanks for the push! Looking for a site to order the plant. What site did you use? I am going to try to make a salve with with plant. I do use the ointments as well. Thanks Andrea for the great info! Thanks to your blog I have purchased a pack of seeds and already planted some, which just started sprouting. Looking at the seed packet I’m not sure if I got the correct one. You mention to make sure it says Calendula officinalis but my packet only says “Calendula Burpee’s Best Mix” and they are seeds by Burpee. Any thoughts on whether or not these are the right ones?? Thanks in advance!! Thanks you so much! I think the first thing I’ll make is a healing salve. I have 2 small boys and they are always falling down and getting scraped up 🙂 I LOVE your site!! Thank you so much Pam! A simple calendula salve is a great idea! You’ll never want to be without it once you start making and using it. How exciting!!! What do I do with it, if I grow it? Calendula is a very happy looking plant, which makes it a yes for my garden. A healing salve sounds great, but I have no clue how to do that or what ailment you’d apply it to. I love Calendula. I made some calendula oil last year and use it for minor skin irritations… even on my pets. Works wonderful. I get my seeds from Baker Creek. I like to keep them on hand too. 🙂 Would love to hear how others use their calendula. From following your blog I’ve started to understand the benefits of Calendula and have already bought my package of seeds to start. I also have a supply of dried on its way to make things now. I’m so excited to start growing my own and it’s all because of your blog. Thank you for sharing your knowledge. I look forward to more wonderful posts in the future. Thanks! Awesome Kira!!! Growing calendula is super easy, it’s a very forgiving plant, and it will only inspire you to learn more when you have your own supply 🙂 Not to mention all the money you’ll save! 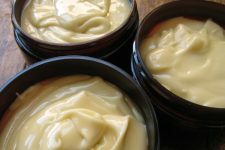 I use it in salves mostly, usually for diaper rash cream. I myself have grown kids and never used it then, have learned how wonderful it is. It is very easy to grow and keep picking it as mentioned keeps a big supply blooming. I’ve heard that Calendulas are benificial to a lot of other plants, like tomatoes and peppers…but I’ve been scared to plant them because I’ve heard they also attract spider mites (which are the bane of my gardening existence). What’s you’re experience with that? 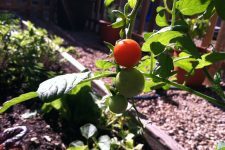 I’ve had great success with planting regular garden marigold with tomatoes and basil (I’ll do the calendula this year). We’re on 5 acres in the country, so we have a lot of critters in the garden. We also put crushed egg shells at the bottom of the whole (next to roots) for our tomatoes and bell peppers. These two plants need more calcium than the rest of the garden plants. We also have 2 llamas and their poop is great for the garden soil…you do not need to let it age…you can till it right in. If you know anyone with llamas, see if you can get some. We’re in Sonoma County, CA and I would be happy to share. Are you going to publish how to process it too? I really like this idea and will plan on planting some this weekend. I usually buy my seeds from Baker Creek or Mountain Rose. Mountain Rose seems to be out of them but I can’t tell whether Baker Creek’s are considered Calendula officinalis. None of them say so. Would you happen to know? Can I use any of the available varieties? I have various medicinal seeds for the garden this year. I’m in the first stages of studying to become a Master Herbalist through ‘The School of Natural Healing.’ I bought herbs in bulk from Mountain Rose Herbs so I can get started in making my own herbal formulas. But I aquired many seeds from another herbalist and bought the rest that I needed. Another good flower to grow is arnica (Arnica Montana). It’s $51 for 8 oz. of whole flower heads at Mountain Rose Herbs. Also very healing for sprains, bruises and muscle pains. Heather, Best of luck to you ! I grow many plants in flower pots and boxes having a postage stamp size backyard. Calendula does well in flower pots, be sure to keep watered and be sure to pick the flowers. In fact, at the end of the growing season let some of the heads go to seed and then watch them and drop them back into the pot. A few years ago a friend gave me 5 seeds to start my collection. Last summer, some of the heads had 15 seeds in each, so your calendula garden could expand quickly. Oh, I love growing calendula! It’s a must in my garden every year. The butterflies like it too. And last year, I still had bright, flowering plants through the first couple of snows here. I have only dried the petals before. I plan to do some infusing this year though. I’d love to try these on my balcony this year, but I’m not sure if they are one of the flowers that attrack wasps. Does anyone happen to know? I’m allergic and already have a hard time keeping them from nesting on and around my balcony. This is my second year growing Calendula, and my third year making salve from the flowers. I loved it as a diaper rash preventative, and we use it for skin irritations, and my great grandfather uses it in a nursing home for bed sores. I have been told that is has been the only thing that has worked to help prevent them, and heal. I have hospice people waiting for me to make enough to sell. We now have home, with much more room to garden, maybe I will get enough this year to be able to share it even more. I also bought our seeds from Baker Heirloom and plan to save the seeds this year. hahahaha…Oh Steph…you know this community too well 😉 I haven’t had this issue…I hope someone else can share their experience. I tried one summer of 2010. I planted a Calendula and a Coreopsis. The Calendula didn’t make it, but I still have the Coreopsis. I may try one again later. I have so enjoyed learning about the benefits of Calendula, while my sons are well past the age of diaper rash, I, myself, suffer from skin issue and haven’t found an over-the-counter remedy that really works. At any rate, I am a little confused about the plant itself. With good intentions, last year I grew, harvested and dried marigolds thinking I was preserving calendula. Was I? Are marigolds and calendula the same plant? I like the calendulas with the dark red backs of the petals, especially in soft colors. I’ve grown the Triangle Flashback and Touch of Red Mixes, and some that are singled out in the softer colors. They do reseed well but I let the population get a bit small and didn’t save seed— wish I still had seed saved in the softer colors, I may have to start over with some mixed seeds I still have. I have a 15 mos old niece that have been having persistent eczema since she was 3 mos. We’ve tried all those Glaxall based ointments, Aveeno, salt baths, oatmeal and expensive prescribed steroids. It was so frustrating and poor girl always crying and have bruising because of scratching! We tried that Spectro for a while but it just dried up the skin and doesn’t heal properly. I stumbled across the net the benefits of calendula for eczema and went hunting for it and found an organic lotion that was made out from it with almond oil and goat’s milk. It worked like a miracle in two days, we noticed of her not scratching at all and the areas affected are soft and skin was not blazing red. It looks like it was healing nicely. After two weeks of that ointment, her facial eczema improved! And because of that, I am going to plant calendula in my garden as a must. I heard it’s good for acne and blemishes as well. Andrea, How long will Calendula infused water last? Do you have to make some every time you make the Calendula Lotion, or can you make a larger batch up and keep it to use again sometime? This is such a beautiful blog… I think I may have been here before but with all my babies its hard to remember! I just ordered some heirloom calendula seeds this week, we’ll be getting a late start on it but I’m pretty excited. Hopefully we’ll get a few flowers before frost! 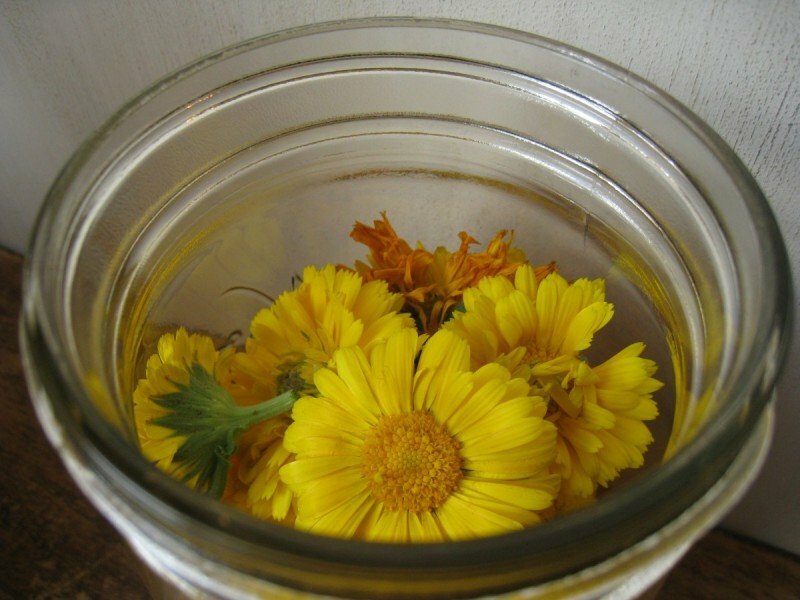 I’d really like to make some calendula/plantain salve for bug bites. I have calendula growing now on my windowsill. Should I thin it out? It seems like the plants are shooting off in crazy ways and beginning to lay down without any flowers. 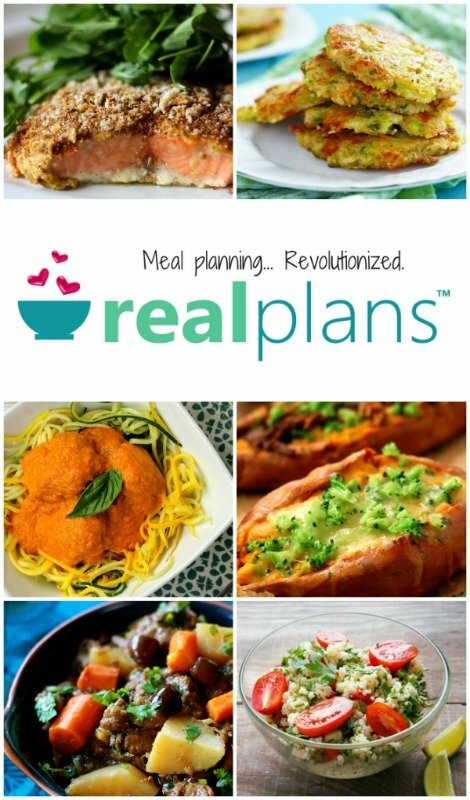 VERY EXCITED ABOUT THIS SITE.. FIRST TIME HERE, CAME ACROSS IT TRYING TO MAKE SURE I HAD THE RIGHT MARIGOLD/CALENDULA PLANT. IT IS AMAZING FOR SKIN PROBLEMS. CANT WAIT TO SEE MORE OF YOUR TOPICS AND PLANTS. WILL BE TELLING MY DAUGHTER ABOUT THIS SITE… SHE IS IN SCIENCE FIELD (GENETICS) AND LOVES CALENDULA…. HOPE I CAN FIND THE SEEDS IN CANADA………. Will the deer be attracked to this? I used to work at a retail nursery back in spring/summer of 2010 and remember an onslaught of customers snapping up our calendula plants/seeds. Now I know why! I have grandiose plans for a spring/summer garden this year now that we moved from a 6×6 concrete slab of a “backyard” in Portland Oregon to a huge backyard with full sun and an orange tree in Sacramento California, and this is definitely on the list! I love this plant because it does so well in cold, even freezing weather. It’s the beginning of Feb. and I just found some sprouts that came up under the flowering plant. It does great all year round if in a protected area next to house it will flower all year long. I live in southern Oregon so we get freezing temps . Also every one is saying they love water well I am here to say they are pretty drought tolerent too. I have some that grow along my fence that don’t get much water and they are pretty hardy. I found seeds of a calendula variety called Erfurter Orange Calendula, described as ‘the commercial strain used for medicinal flower production in Europe’. It is sold by Richters (www.richters. com) , a company which specializes in herbs. They ship to both Canada and the US. They also have seeds of a commercial strain of chamomile “Bodegold” if you wish to grow that to infuse in oil. I have a question. I started growing Calendula here in Virginia 2 years ago and want to know if I should cut down my spent plants in the fall or winter and will they grow back up, or should they be left alone. The few dead leaves on them look ragged in the spring. I would love to buy some of these seeds from Mountain Rose Herbs but I don’t want to buy just one seed packet and pay a crazy amount for shipping. I was wondering what other seeds you would recommend? Also, I live in an apartment so space is limited. Thank you for you’re site! I visit it everyday hoping to learn something new! I can’t even find it in my town and I live in a decent size town. What gives? Should I order seeds? My first time here very interesting site I’m growing my calendula from a nursy plant iys goings well so far but i didnt know about the medical uses. Can I move calendula or do I need to wait for the seeds then plant in new places? Excellent info, I am looking to try and grow Calendula in a greenhouse during the Winter in Southern Louisiana, you think I will have any problems with that? I’ve got to try growing these, perhaps, I may have to wait until later in 2014, to get them started. I live in South Australia and have just planted some Calendula as well as other plants, mainly for the flowers so that our Old early settlers cottage will have an abundance of flowers for when we go to sell the place, however we will be moving to our other house, the land is primarily limestone, if we either dug out large holes and filled it with garden soil, would the Calendula’s survive, I realise that the lime will leach into the garden soil over time or doesn’t it matter too much. Any advice would be great. Calendula grows well in sun or shade . Mary from Australia try sinking a planter pot in the ground at your new place to keep the lime from leaching I to the soil of you calendula. Some of you have asked about how to process it. Pick flowers before seeds set on them dry flower heads petals add a nice Clorox your oil. To make oil fill Masson jar half full of dry flowers then poor a carrier Oil then filling jar up to 1/2″ below top. Cover and let sit for 3 to 6weeks. Shaking every few days to infuse the oil. When ready strain flowers from oil. Use in salves or just use the oil straight on rash etc. Carrier oils are olive oil , grape seed oil, almond oil. Also some one asked about wintering over the plant. I have had good luck in them coming back from last year’s growth, most years and I have grown it about 8 years or so. Just in case of a bad winter where roots may get frozen save some seeds each season.They will take over if you don’t dead head them regularly. They make a great cut flower if you get too many. Good luck everyone. My calendula grow about 2 inches tall with tiny leaves on top and then fall over and die. They do this planted outside or started inside in a pot. I’ve had a few live but the majority die. What am I doing wrong? Any help would be appreciated. I planted Pacific Beauty Mix. Thank you for your site! I live in middle georgia.